Auto Brite practices the SMART way of carrying out repairs to vehicle bodywork and trims, which has been developed to offer a fast and cost effective way of refinishing small, to medium vehicle damage. We are an "EXPRESS Bodyshop", where we repair, rather than replace, anything from a scratched mirror casing up to a full side with light to medium damage. Repairs are carried out to the affected area only, and seamlessly blended into the undamaged paint, meaning they take much less time to repair than in a conventional bodyshop and use around 50% less materials, which in turn is better for the environment, as well as your pocket! Each vehicle is repaired from start to finish, using the best available materials and equipment, in a clean, controlled environment, to return your car to its' original condition, in the most efficient way possible. 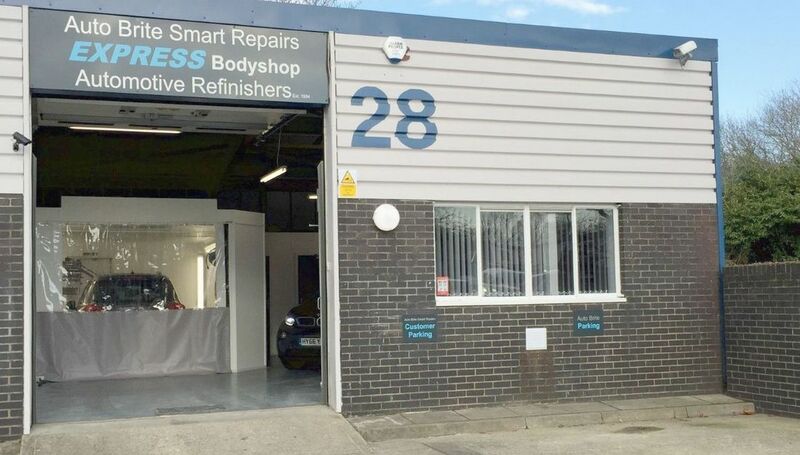 We offer the convenience of a Smart repair, but with the reliability and quality you would expect from a bodyshop. Do you have a Smart insurance policy, purchased when you bought your car? You can choose who carries out this repair. If you would prefer it to be worked on in an ideal environment by an independent business, rather than a franchisee on your driveway, just let the insurance company know. We are situated just off the main Segensworth roundabout, within a mile of junction 9 M27 at Unit 28 Mitchell Close, close to Whiteley, Locks Heath, Park Gate, Warsash, Titchfield, Sarisbury, and Botley, between Fareham and Southampton. We regularly carry out repairs for many local businesses, some are listed in our referrals, and are very popular with employees at large nearby offices such as ONS, Zurich and N.A.T.S, as well as Whiteley Village, due to the "same day" convenience we can offer. We also have a Facebook page, where you will find the most up to date examples of our work, as well as genuine reviews from some of our valued customers. We are a husband and wife team who take pride in offering a clean, female friendly environment for your vehicle. The following pages will demonstrate the types of repairs Auto Brite specialise in. For further information, a free estimate, or any advice on your car body work, please call, or email using the form provided.